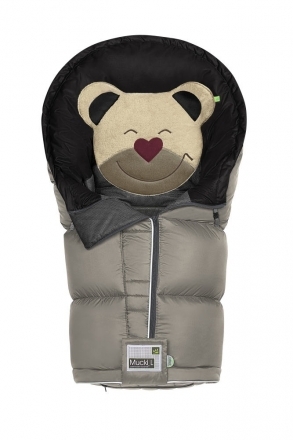 The windproof and water-repellent winter sleeping bag Mucki L Classic convinces with its particularly warming Muckitex membrane and its sophisticated zipper system, through which the sleeping bag can be completely folded out. Many outdoor fans have already taken the innovative trendsetter with the teddy-face into their heart closed. Because here you do not only get embraced by warmth and security, but also by many practical extras. For example the neck area can be kept open by the clip-up closing and the new muckitex membrane inside forms an effective heat retention. Turning over the backrest prevents the footmuff from slipping off. The adjustable zipper allows the footmuff to vary in two-digit width. So that your child not only feels good but is also in good hands, the Mucki L has a safety bag. This is located at the back of the headboard and makes the cord disappear safely. Nothing works by itself and disturbs - the clip-up closing keeps the footmuff slightly open. So the little passenger can comfortably enjoy the view and the fresh air. Thanks to the attachments you and your baby are seen faster at night and accidents are prevented. All details are well thought out and should make the handling as easy as possible. So the footmuff can be opened completely. The child can get in very comfortably and the footmuff can also be used as a changing mat or play mat. The separately opening bottom makes the Mucki L even for older children still usable. The footmuff is provided on the outside with a water-repellent fabric and is easy to clean. Inside the footmuff is also coated in the foot area, so that the traces of some adventure tour can be easily removed. The fiber balls are ideal for allergy sufferers. They are filled in individual chambers, creating a natural air circulation. In addition, the footmuff is particularly easy to care for. • filling: cuddly high-bulk fiber balls (polyester) - suitable for allergy sufferers!